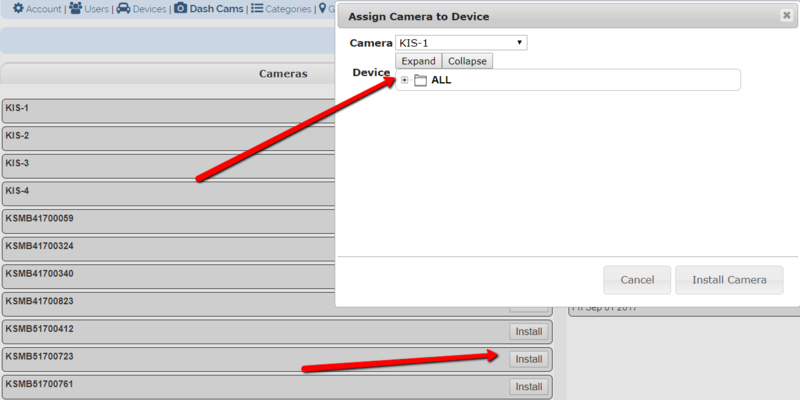 Dash Cam Settings allows to you establish Camera Rules. You are able to define specific events that trigger recording, both video and still. A profile can contain multiple rules and can be assigned to multiple cameras. This keeps you from having to re-create rules for each individual camera. This section is also used to pair (install) the tracking device with the dash camera in the same vehicle. There are two very important reasons these two need to be matched with each other: 1) tells the system to override the dash camera’s tracking capabilities for the tracking capabilities of the Calamp tracking device (to avoid duplicate tracking since the dash camera also provides GPS tracking) 2) ensure there is only 1 listing throughout the account of the dash camera and Calamp device associated with each vehicle (groups the camera and tracking device together since both are in 1 vehicle) – avoids duplicate device listings. Having both of these devices gives you maximum tracking and dash camera images, and allows you to set up Camera Rules to specify account actions for certain events.